The joker is feeling jolly and is spreading cheer around like confetti. 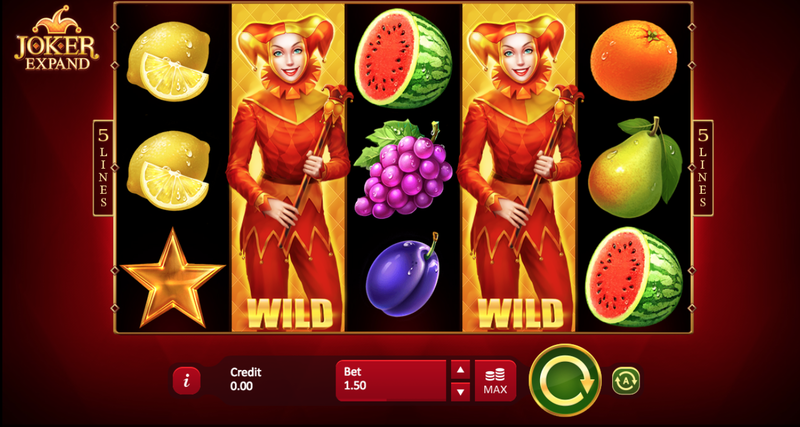 Joker Expand is a 5 reel, 5 payline slot with a retro fruit machine theme. The joker is being mischievous and is handing out the Queen's cash (unbeknownst to her) to some lucky people. Want to be one of those lucky people? Hit spin to discover how generous the joker will be today! This online slot has a very slick and simple design yet it is vibrant and colourful with juicy fruits. You'll find the same shiny fruits as you would in any fruity including cherries, plums, and oranges. There's also the typical lucky red 7s and golden bells. As well as a simple design, gameplay is very straightforward with wilds and scatters. Play today at Easy Slots! 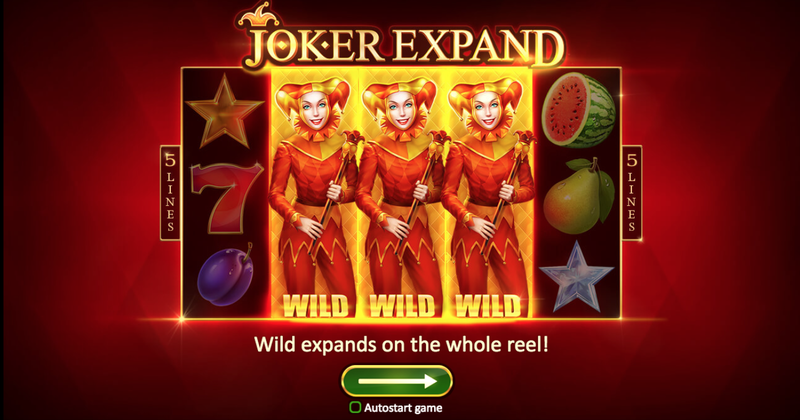 Joker Expand is a 5 reel, 5 payline slot with a traditional fruit machine theme. If you enjoy the ease of a fruity game, then you will enjoy this one. The cheeky joker is handing out cash left, right, and centre. She seems to be in a very good mood so let's hope you can create some fantastic wins. The design is effortless. The background is a plain deep red colour and the reels are edged with small gold trim. Juicy colour fills the reels with various fruit symbols including purple plums, lemons, sweet cherries, watermelon, oranges, pears, and a bunch of grapes. You'll also find lucky red 7s, gold and silver stars, golden bells, and a female joker. Fruit Symbols - The plums, lemons, oranges, and cherries offer the least in this slot. Landing 5 of a kind will grant you 20x your stake. Slightly better are the pears. These award a 40x multiplier when you land 5 on a payline. The top paying fruits are the grapes and melons. Receive 100x your stake when you land 5 on a line. Lucky Red 7s - The symbols to look out for in Joker Expand are the lucky red 7s. Landing 2 lucky red 7s will award you 2x your stake, landing 3 will award you 10x your stake, landing 4 will award you 50x your stake, and landing 5 will award you a whopping 500x your stake. The Wild Symbol - The wild symbol is the female jester. A winning combination of wilds will cause the joker to expand and completely fill the reel with wilds creating even more exciting wins. The Scatter Symbols - There are two scatter symbols in this slot. The first is the silver star and landing 3 of these will award you 20x your stake. The second scatter is the golden star which can award up to 100x your stake. Playson is fairly new to the online casino world and online slots games. They launched in 2012 and although they have not been around long, they have certainly made an impact with their new and innovative games. Their aim is to create online games that have unique solutions for players all around the world to enjoy. Every Playson slot has fresh features, stunning artwork, enchanting audio, balanced mathematics, and advanced technology. Playson has a strong 40+ games collection which is always growing. If you're looking for a slot with a difference then make sure to check out Playson. If you liked Joker Expand, why not check out these Playson titles? Slots with a fruit theme are always fun and packed with nostalgia. Joker Expand is a straightforward game in terms of gameplay, features, and design. It really is nothing new but it's exciting nonetheless. The fruits add a nice vibrancy to the reels making is more fun to look at while you play. The lucky red 7s are the most exciting as landing just 5 of these can award you with 500x your stake.